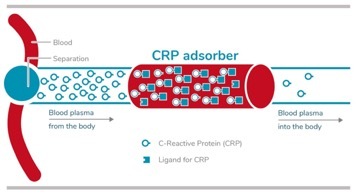 CRP is a molecule which is produced as an acute phase protein due to inflammatory events or infections and which is involved in the disposal of dead cells, but also of vital ones as well as in infection defence. Amongst other things that leads to wounds being kept open in order for immune cells to have time to get to the wound and fight intruding pathogens. That is usefull as long as the wound is on the skin because pathogens can intrude here. When it comes to organ damage like a myocardial infarction or stroke CRP leads to growth of the primary damage area. Over the last two decades, the survival rate after acute myocardial infarction has improved significantly. The prognosis of patients after infarction, however, has improved only moderately, ie the occurrence of subsequent infarctions and especially the development of unstable angina or heart failure still represents a significant risk, causing high costs. This is where the therapy by means of CRP reduction helps. 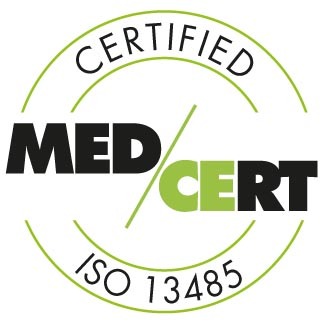 PentraSorb® CRP binds CRP from the plasma of the patient by means of a fully synthetic ligand, thereby reducing the damage after infarction and thus the pathological remodeling processes of the heart. Also in stroke and rheumatism CRP seems to have a pathological influence, so that the PentraSorb® CRP is also designed for the treatment of stroke and rheumatism. Specific adsorbers for CRP reduction represent a novelty. Currently there is no medication for CRP reduction available in the market.